The system uses the latest NI PXI components combined with a NI extension for switching, loads and signal conditioning (SLSC). 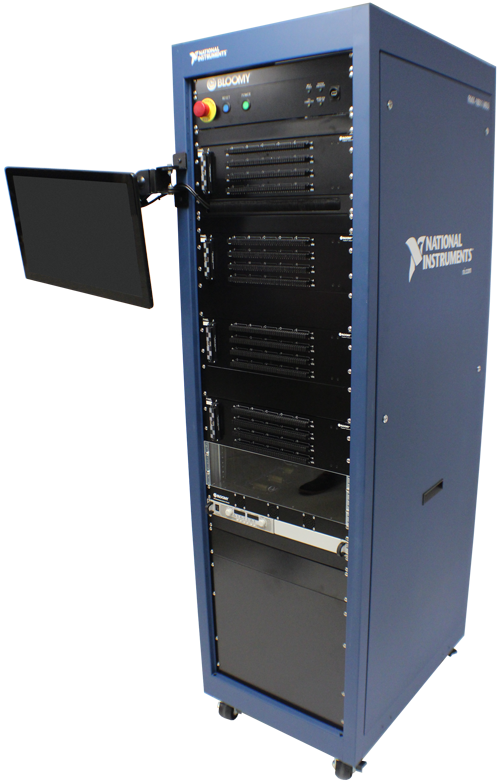 The system includes a wide variety of sensor and communication simulation modules which are specifically designed for aerospace and defense applications, including VDT, resolver, synchro and thermocouple simulations, as well as ARINC 429 and MIL-STD-1553B avionic buses. 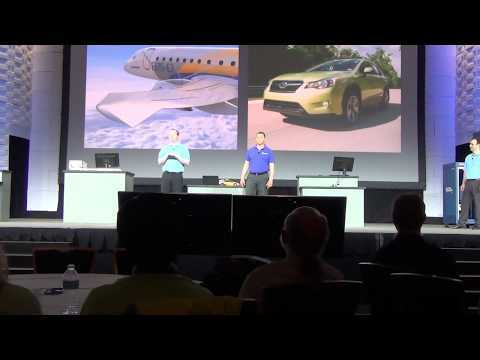 Utilizing NI's VeriStand real-time test software, aerospace companies can integrate their own models from Simulink and other modeling software. This combination of off-the-shelf technologies and a powerful real-time environment addresses testing a variety of aerospace electronics assemblies, such as electronic engine controls, flight control computers, and subsystem controllers. 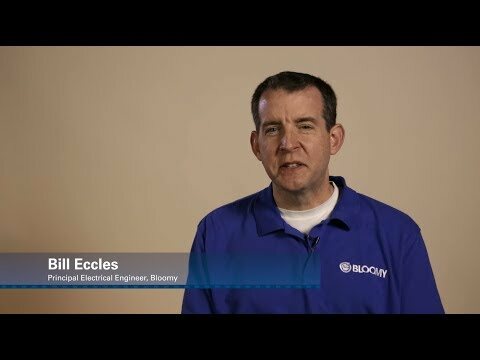 Bloomy provides several of the SLSC modules as well as integration of turnkey HIL systems. offers 8 channels of variable differential transformer (LVDT, RVDT, resolver, synchro) simulation. provides a standards-compliant MIL-STD-1553B with 16 RTs, 8 BCs, 8 BMs for the NI SLSC platform. provides isolated current and voltage measurements for 8 on-board 5W loads or off-board 120W loads. provides a highly-flexible connection between the UUT and resources in a NI SLSC-based test system. offers up to 16 channels of variable differential transformer (VDT) sensor simulation. 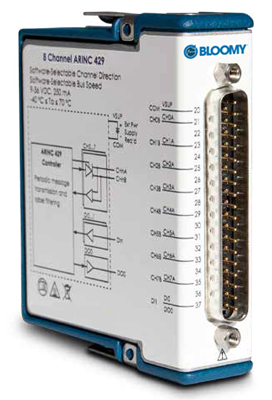 provides up to 8 channels of direction-selectable ARINC 429 for the NI CompactRIO platform. provides standards-compliant MIL-STD-1553B with 2 RTs, 1 BC, 1 BM for the NI CompactRIO platform. The SLSC VDT/Resolver Simulation Module offers eight channels of variable differential transformer (VDT) sensor simulation at an unmatched price point. 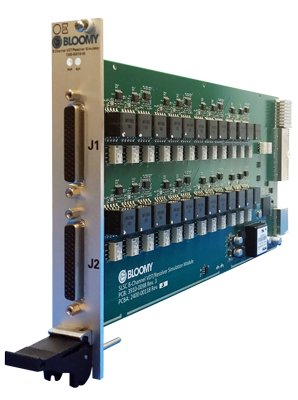 The Bloomy ThroughPoint™ Interface Panel provides a simple, yet highly-flexible connection between the unit under test and resources in a National Instruments Switch/Load/Signal Conditioning (SLSC)-based test system. 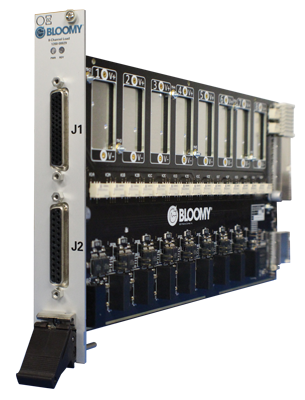 Bloomy’s BCI-1553 C Series module provides a versatile, standards-compliant MIL-STD-1553B interface for the National Instruments CompactRIO platform. The module uses the high performance, industry standard Holt HI-6131 integrated terminal to provide a single dual-redundant bus interface. 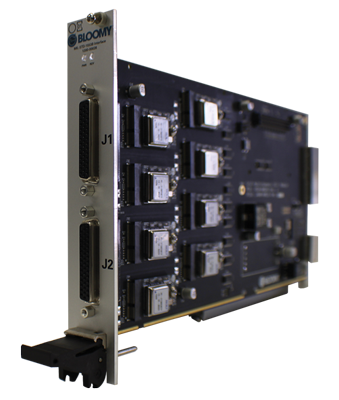 Bloomy’s ARINC 429 C Series module for NI CompactRIO platform facilitates test and simulation of systems which incorporate ARINC 429, the predominant avionics data bus for commercial and transport aircraft. 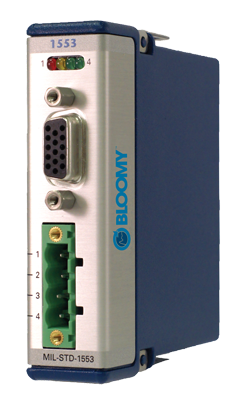 Bloomy named Hardware-In-the-Loop (HIL) Specialty Alliance Partner by National Instruments (NI). The company received this designation for its specialized skills in HIL testing, as well as its in-depth knowledge and enhancements of NI HIL platforms and architectures including PXI, SLSC, CompactRIO, VeriStand, and TestStand.